Okay, this isn't exactly a Columbus food related post, but I thought it was a funny story and I wanted to share it. When I was at Kent State, I got dinged on a question on an elementary II French test and lost two points. The question was about which things would you buy at the grocery, bakery, or the chacuterie (cold, preserved meats) which tested if you knew the vocabulary for food items and portions (piece, bag, etc). 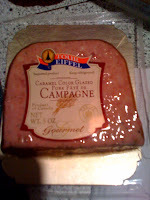 My "wrong" answer for the chacuterie question was "une tranche de pate" which is a slice of pate. I went to my INCREDIBLY stuck up grad student professor to argue this, considering I was working at one of the oldest and best known gourmet markets in Northeastern Ohio (West Point Market) and I knew darn well that we sold pate by the slice during the holidays. She said "well, as you know I did my undergraduate studies in France" (insert hair flip here) "and I've never heard of such a thing, but since you work at a gourmet market, I will give you one point back". I somehow managed to get an A in the class, and never really thought about it again. Until two hours ago when I was looking in the cheese cooler at the Grandview Kroger. Une tranche de pate. Vacume sealed for freshness. I will be calling the Kent State University French department tomorrow morning to ask for an official correction to my transcript. Whew! Glad to know you don't hold a grudge!!! However when one is right, one is right. You go girl! It's not a grudge so much as the fact that she was snotty about it...(and everything else) If she had been nicer I don't think I would have cared so much. But yes.. I was RIGHT!